Here are ten iOS 10 features that Apple has discontinued in iOS 11 for iPhone, iPad and iPod touch devices. Here are the details. We’re not quite at this stage yet, but the release of iOS 11 is ultimately going to mean that millions of device owners will be migrating away from iOS 10 across to iOS 11 when it’s publicly available later this year. 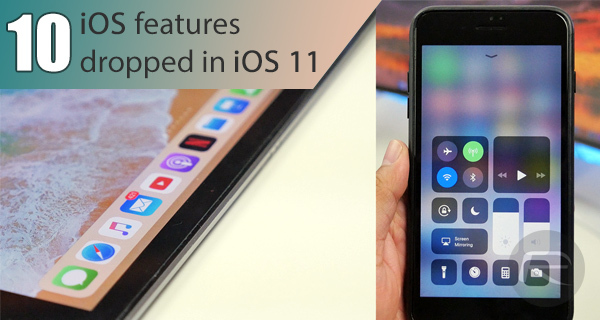 While iOS 11 has introduced a ton of new features, some of the refinements in iOS 11 mean that a number of features from iOS 10 have been dropped for good. It’s worth mentioning that any of the features from the list below could be brought back at any time, but for now at least, we have a list of things removed by Apple. 32-bit App Support: This one has been frequently talked about for quite some time, but Apple has officially dropped support for 32-bit apps with the release of iOS 11. This means that apps which haven’t been updated with 64-bit compatibility will not be available to iOS 11 devices. More information on that here: iOS 11 Compatible Apps: Apple Drops Compatibility For 32-bit Apps. 32-bit Device Support: With any major release of iOS, there are always device casualties. This means that Apple will generally cut devices out of the install process. Where iOS 11 is concerned, no 32-bit app support means that no 32-bit devices are capable of installing the iOS 11 firmware. 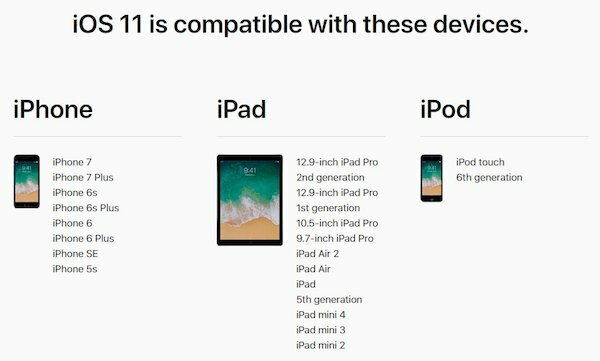 More information on that here: iOS 11 Beta Compatibility For iPhone, iPad, iPod touch Devices. Search Bar for Purchased Apps in App Store: This one could actually be an initial iOS 11 beta bug as it seems like a strange move to remove it, but with the redesign of the App Store, it is no longer possible to search for apps in purchases section. Double-Tap to Refresh App Store: This handy little feature in iOS 10 probably wasn’t used by most device owners, but for those who knew about it it was extremely handy. It’s now been entirely removed, but once again this could be an oversight as part of App Store design refresh, and could definitely form part of the known iOS 11 bugs list: iOS 11 Beta Bugs And Problems Discovered So Far [Running List]. 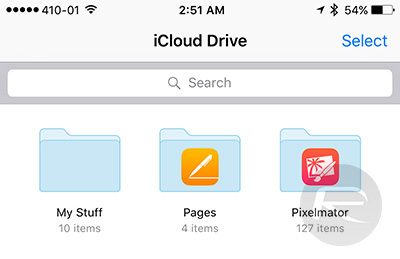 iCloud Drive App: The shiny and relatively new iCloud Drive app is no longer on the devices with iOS 11 installed, and has been replaced by the new Files app. It’s gone, but there’s a more extensive replacement. Native Social Network Integration: Apple had previously made it very easy to add a number of social networks such Facebook, Twitter, Vimeo, Flickr etc for sharing purposes directly through the Settings app. With iOS 11, this has been totally removed without any prior warning. Two-Pane Today Widgets View on iPad: We aren’t exactly sure how many had actually realized that this had changed from iOS 9 to iOS 10, but it’s now back to a single-pane view exactly how it was in 2015 with the release of iOS 9. Control Center With Multiple Panels: As presented at the opening WWDC keynote, the customizable Control Center has been put through what feels like an entire overhaul. It now resembles a Tetris board when you start adding more and more widgets in but gone are the multiple panels that you need to swipe through. Ability to Dismiss Individual Notifications: This is another one of those ones that feel a little bit strange and could possibly be yet another oversight. Like or lump it, the ability to dismiss single notifications has now been removed. So this should really be titled, “Things from iOS 10 that are missing in the iOS 11 Beta”, as the author has no clue if these features will actually be dropped (other than 32 bit support, which was covered extensively in numerous other places). what we meant was search bar for Purchases. and swipe up to close apps on iPad. Also 3D Touch on side of phone to enter app switcher is gone/missing. I know this feature was always overlooked, but was quite convenient once you became accustomed to it. I didnt know about this! Thank you!! Has anyone else noticed you can’t use Airdrop at present and it is no longer located in the control centre. There is no way to turn it on or off either. You can still use it, just hold down on the box of wifi settings (works for non 3D Touch devices too). And same goes for nightshift, hold down on the brightness slider. Flash a custom ROM and any Android device is updated for as long as the hardware can take it. And best of all, if the hardware CAN’T take it, you can just downgrade, and opt out of updates. I’m very frustrated that my 32-bit iPad will probably never get jailbreak cause it can’t be downgraded. I long for the ease of updates and downgrades that’s possible on Android on iOS. At least Apple won’t be bugging me to update to 11, so lack of 32-bit support is good news for me. iOS 10 forever, for better or worse. Apple just cant figure out better Control centre design, I really dont like iOS 11 , it seems like some new intern put random blocks on screen just like that, 10’s control centre is much better for me. You can access your store purchases by going to the App Store > Updates, and tap on the iCloud icon (your iCloud user photo) when on this page.